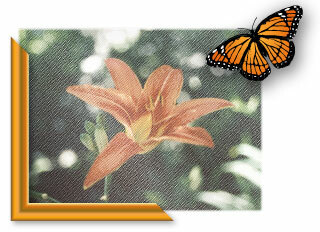 This began as a photograph of a tiger lily from my back yard. 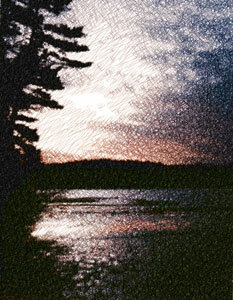 I used the photo crosshatching filter in Illustrator 9 to create a vector drawn texture for the values in the image. I then combined the vector crosshatching with a diagonal gradient blend in multiply mode. I then used the resulting black & white vector illustration (along with some more mask elements for faded edges) as a transparency mask for the original photograph. I then drew the butterfly and frame on separate layers. I targeted the butterfly group and applied a drop shadow to it, then repeated for the frame. 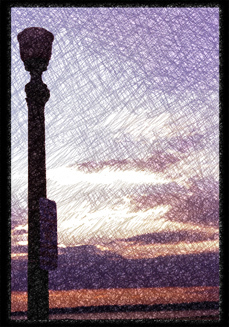 This image uses the photo crosshatching plug-in filter that was introduced in Adobe Illustrator 8. I then was able to combine the vector cross hatching with the original raster image using Illustrator 9's transparency masks. This image is also displayed in the Illustrator 8 & 9 WOW books. This image also uses the Illustrator photo crosshatching plug-in filter. I then exported the Illustrator layers to Photoshop and combined the cross-hatching results with the original photo using blending modes. The artwork was featured in the March 2004 issue of SBS Digital Design magazine. 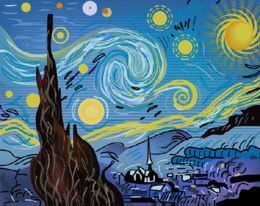 This is my vector illustration version of that painting that inspired Don McLean's "Vincent" song. 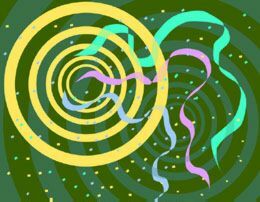 This was done in Adobe Illustrator 7. This is one of my cool designs that I made while studying color. The little ribbons there are supposed to look like they're going through the rings.